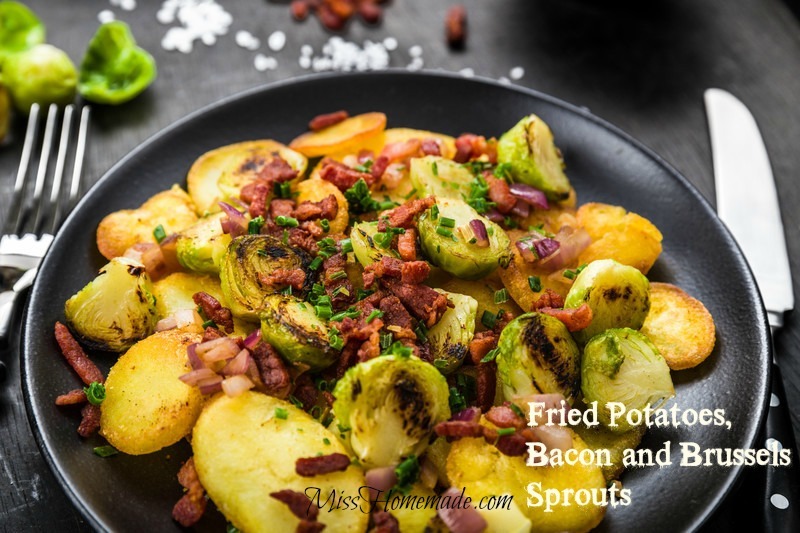 Amazing brussels sprouts recipes that will turn those who don't think they like them - into raving fans. Makes a perfect side dish or a lighter meal. Mix the brussels sprouts and potatoes together in a large bowl and drizzle with olive oil. Place on the baking sheet and season with garlic and onion powder, salt and pepper to taste. Roast vegetables for 35-40 until sprouts and potatoes are soft, light brown and begin caramelizing. Meanwhile, heat pan to medium and cook bacon until it just starts to crisp up. Drain and place on paper towels. Mix with the vegetables when done and serve. Bring a pot of water to a boil and add the prepared brussels sprout and potatoes to blanch. Meanwhile, heat a large skillet on medium heat and begin cooking the bacon. When the vegetables are done, drain and add to the bacon. Season with garlic and onion powder, salt and pepper. Continue frying until the vegetables are soft and brussels sprouts are caramelized. Notes: If you want, you can add some chopped onion to the mix which is delicious, by the way. The potatoes in the photo are bigger and I didn't like them as much as I like the smaller bite-sized pieces.